small fire on the platform. So, often there will be a pause at a particular platform while riding the train. And sometimes the pause is between stops so you have no escape. Those of us lucky enough to have smartphones or e-readers/ipads might be able to busy ourselves for a while but remember there is no signal underground and your battery is only going to last so long. 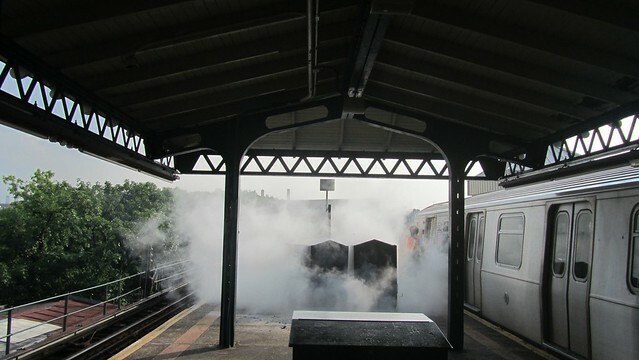 Anyway, after some time the announcer will come on and let us know that we are “being held momentarily due to train traffic ahead” or that there are “delays due to an earlier incident” or sometimes due to a “smoke condition” on the track caused by a nearby fire. I have come to expect these things. What’s a tiny delay in the grand scheme of things. I say that knowing that a few months ago I was almost 2 hours late to work due to a train delay. I could have taken a taxi for about $40 to my office or taken an awful bus ride there too. BUT from my vantage point the bus was not an option since it was already handling a huge overflow of normal subway passengers and I saw a few people almost come to blows over the few cabs that passed by. So on that particular occasion, I stuck it out on the platform waiting and wondering what the problem was. Of course twitter and the Gothamist ultimately told me that someone was on the tracks a few stops ahead and emergency crews shut the trains down in order to try to rescue them. It was January and very cold, I was dressed for the cold but not for standing relatively still on a crowded platform for over an hour in the cold. I remember that once I finally got to work, it took another long while for the pain in my hands to go away. All that said, I immediately assumed the next train would just whiz by and not open their doors due to the smoke but somehow the conductor didn’t feel it was a danger and thankfully I was on my way. It really was a small fire and by the time I pulled my camera out it was already being put out. 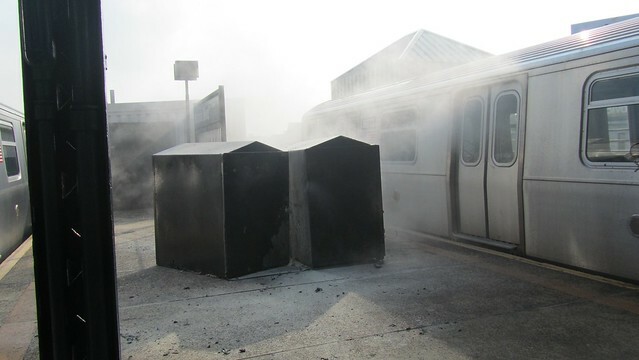 So yay, because (1) I didn’t have to wait long to get on the train and (2) because that small fire didn’t turn into a huge fire and destroy my entire platform – which only just occurred to me as an option. Also yay, ‘cuase no one was injured during this little incident. small fire on the platform being put out. small fire on the tracks, smoke already dissipating when the next train arrives. This entry was posted in everything i've blogged. Bookmark the permalink.